HONOLULU (Oct. 8, 2018) - A pioneer and strong advocate for the Native Hawaiian community was recognized this week with the honor of being named Native Hawaiian Community Educator of the Year by Kamehameha Schools. Hinaleimoana Wong-Kalu, well known as “Kumu Hina,” has served the Native Hawaiian community in various forms as a student, teacher, political voice, rights advocate and role model for more than two decades. “Today, we honor a leader who is a champion for educating Native Hawaiians of all ages and improving their overall well-being,” Kamehameha Schools Senior Policy Analyst Ka’ano’i Walk said. She earned her BA in Hawaiian studies and education from the University of Hawaii at Manoa before going onto teach ‘Ōlelo Hawai‘i at Leeward Community College. Add to her extensive resume, Wong-Kalu worked with Ke Ola Mamo Native Hawaiian Health Care System where she focused on improving the health of Native Hawaiians. Much of her time is also spent teaching inmates Hawaiian culture-based skills at local correctional facilities. 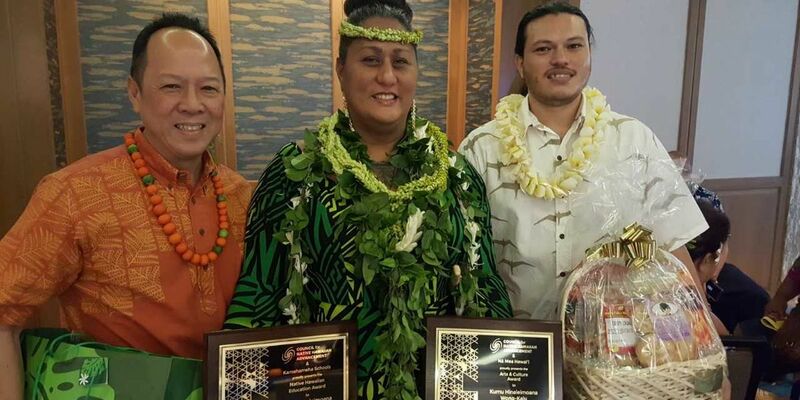 “Thank you to all of you who have taken the time to present me with this great honor,” Wong-Kalu said after being presented with the recognition at the 2018 Na Mea Hawai‘i Arts & Culture Award at the Council for Native Hawaiian Advancement’s Native Hawaiian Convention at the Prince Waikiki. Wong-Kalu also is the chair of the Oahu Island Burial Council, which addresses issues of unearthed iwi kupuna, most recently speaking out regarding the discovery of remains at Kawaiha’o Church. Said to be her most influential work however is her time spent with Hālau Lōkahi Public Charter School as the cultural director from 2001 to 2014. There, she incorporated a rigorous Hawaiian culture-based education program which empowered a whole new generation of scholars. “I did proclaim 2018 as the Year of the Hawaiian. There’s much more work to be done, but it’s important to stop and celebrate…the Hawaiian language and culture that are thriving,” Gov. David Ige said at the ceremony.